New York: Charles Scribner's Sons, 1930. 1st Edition. Hardcover. Good/Poor. 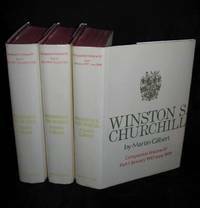 Originally published in October 1930 in England as My Early Life, A Roving Commission is Churchill's extremely popular autobiography, covering the years from his birth in 1874 to his first few years in Parliament. One can hardly ask for more adventurous content. These were momentous and formative years for Churchill, including his time as a war correspondent and cavalry officer in theatres as varied as Cuba, northwest India, and sub-Saharan and southern Africa. This time contained a wide range of experiences in Churchills life. Not only was he developing as an author, publishing his first books, and making his first lecture tour of North America, but this was also the time of his capture and daring escape during the Boer War, which made him a celebrity and helped launch his political career. Churchill would take his seat in Parliament only weeks after the end of Queen Victoria's reign. 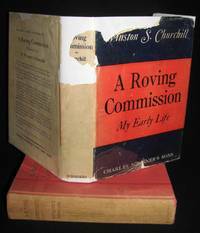 A Roving Commission remains one of the most popular and widely read of all Churchill's books. And for good reason, as the work certainly ranks among the most charming and accessible of his many books. An original 1930 review likened it to a "beaker of Champagne." That effervescent charm endures; a more recent writer called it "a racy, humorous, self-deprecating classic of autobiography." 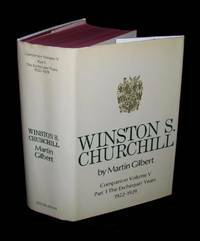 To be sure, Churchill takes some liberties with facts and perhaps unduly lightens or over-simplifies certain events, but this is eminently forgivable and in keeping with the wit, pace, and engaging style that characterizes the book. A Roving Commission sold very well at the time and has seen a great many editions since, many of them collectible in their own right, but of course a premium attaches to first editions. 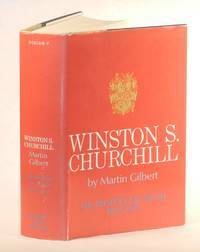 This is one of the few Churchill first editions for which the U.S. edition bears a different title than the British. Jacketed copies are extremely scarce. Even decent unjacketed copies are unusual. The red-orange cloth binding proved highly susceptible to fading and soiling and the orange color on the dust jacket tends to bleach white when exposed to sun. Offered here is a rough example in an even rougher original dust jacket. No getting around it - this is perhaps the worst jacketed copy we've seen. But it is jacketed and we see very few jacketed copies. This copy is also of bibliographic interest, since it is the only first printing copy we have ever seen with the quite rare variant dust jacket usually attributed to the third printing and only the second copy of this variant dust jacket we have seen. This dust jacket has identical spine, front panel, and flaps, but a different rear panel featuring a number of short review excerpts instead of two text excerpts. Richard Langworth ("A Connoisseur's Guide", p.134) ascribes this dust jacket to the first edition, third printing, but it is not noted in any other bibliographic sources. This jacket is a bit of a mystery, since it gives every indication that it has spent its life with this first printing book. As stated, condition of both book and jacket are definitely flawed. The red-orange cloth binding is tight and has square corners, but is soiled, somewhat faded on the boards, quite faded on the spine, and bears some wear at the spine head and tail. The contents are tight, but a bit age-toned with an inked owner name on the ffep and a hint of spotting to the prelims. The Scribner's "A" is present on the copyright page, confirming first edition, first printing status. The dust jacket is unclipped, still bearing the original $3.50 price. That's the good news. The bad news is that the dust jacket has considerable wear and losses. The front face is unfaded, but missing an uneven 3.5 inch wide by maximum 1 inch deep portion at the top edge and with some chipping and wrinkling at the bottom edge. The rear face is soiled and wrinkled, with chipping to a maximum depth of .5 inch along the top edge. 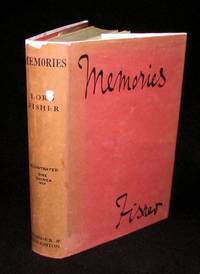 The spine is bleached white and roughly a third of it is missing; only part of the title and part of the author's name remains. Still. the quite rare original dust jacket is present, even if decidedly poor and wrapped around a rough first edition book. The dust jacket is protected in a removable, archival quality clear cover. Given condition, we offer this flawed rarity at a low price. Bibliographic reference: Cohen A91.2.a, Woods/ICS A37(b.1), Langworth p. 134.